We are delighted that you are considering First Congregational Church as the venue for your wedding. We offer wedding ceremonies for everyone; there are no membership requirements. Weddings are a celebration of a wonderful gift you have been given…the gift of love…the gift of someone who will journey with you through life’s ups and downs…who will hold on to you when you are at your best and even when you are sometimes at your worst. Such love is a gift from God and so it is fitting that we would gather in a church sanctuary to seek God’s blessing as you begin your journey together. First Congregational Church is eager to make your marriage a beautiful and memorable occasion. We hope that this following information will help you plan your special day. Planning your wedding at First Congregational Church begins with your meeting with our Wedding Coordinator who will discuss various options with you. If you would like to learn more about the church, you are invited to attend our 10:00 a.m. Sunday morning worship service. Usually one of our ministers officiates at wedding services held in our sanctuary. As your wedding day approaches she will meet with you to discuss the elements of the wedding ceremony. We do our best to accommodate couples in shaping a ceremony that reflects their beliefs and wishes. If, however, you have your own pastor and would prefer for him or her to conduct the ceremony, we welcome that as well. Our Organist and Music Director will also want to speak with you directly about what you want for music during your wedding ceremony. We have a magnificent organ and a grand piano. Music samples may be heard on our website, fccriverside.org The wishes of the couple are honored as much as possible. 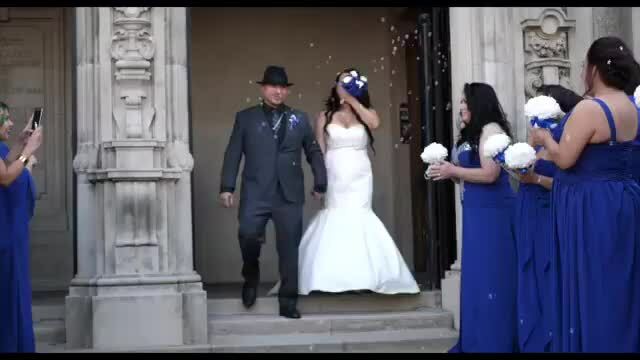 You may use the services of both a photographer and a videographer to record your ceremony. A rehearsal will be scheduled with the wedding party prior to your ceremony. Marriage licenses are issued through the office of the Riverside County Clerk and Recorder. Call (951) 486-7000 for more information. Two chancel candles, a unity candle holder, and two candelabras, either white or black. We provide all candles. A time limit of 3 1/2 hours for the use of the main floor prior to, during and after the ceremony. The fees remain the same regardless of services used. A deposit secures your date and time and is applied to your total wedding cost. A $100 damage deposit is also required at the time of booking and is refunded after the wedding ceremony barring any damage. Balance of fees is due and non-refundable 60 days prior to your ceremony. A premium is assessed for holiday weekends. Use of the downstairs Fellowship Hall is available for receptions. Max. Capacity is 200 persons. The fee for 5 hours is $1,500.00 plus a refundable damage deposit of $300.00. There is a $100 fee for us to remove the existing tables/chairs or to replace them after the reception. If alcohol is to be served (beer & wine only), the reception fee is $1,500 plus a $500 refundable damage deposit. A certificate of insurance including liquor liability coverage is required. No music, procession, decorating, tolling of our bells nor a wedding coordinator. Access to our sanctuary is limited to one hour. Please call the Church Office if you are interested in a “La Petite Wedding”.